There are many games and puzzles based on the number 2; I shall discuss some in this blog. Number 2 is the only even number that is also a prime number. It is also one of the factors of all even numbers. mind and matter; good and evil; high and low; right and left; up and down; front and back; right and wrong; loss and gain;... the list goes on - see if you can think of some yourself. It may be that, to make sense of the complex world around us, we need to look at it in the simplest way possible. Defining two extremes is a convenient way to set reference points for managing complexity. Politicians make important points in groups of three and look at the mess they have created - not able to cope really. Take a sheet of A4 printing paper. Let us assume that its thickness is 0.1 mm. Fold it over once to make its area half - thickness is now 0.2 mm. Fold again (second fold) - thickness is 0.4 mm. If we continue to fold the paper 40 times (can certainly be done in a thought experiment), then the thickness will increase - say, to a value H.
What do you think - make a guess how big H is? Would you believe that the thickness will be ~ 100,000 kilometres!! That is the power of doubling! It is the basis for understanding the ideas behind exponential growth (some people think it should be called runaway growth). 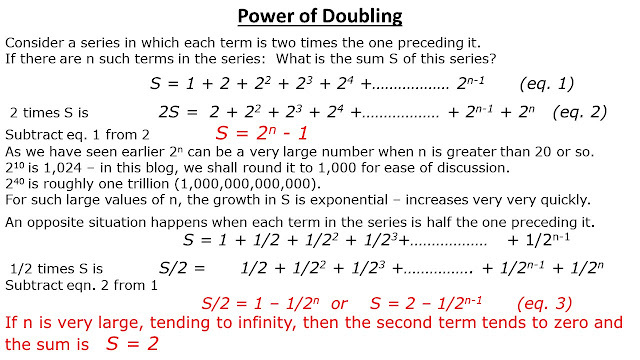 For some of my favourite examples of the power of doubling, click 1, 2. We have looked at an example of doubling in folding of an A4 paper. Let us consider one more example of the interesting fable to further demonstrate the power of doubling. All the wheat in the kingdom was not enough to fill the board! Let us now consider an example of the second case (eq. 3) where each successive term halves. Example: A bouncing ball is dropped from a height of 1 m on a concrete floor. The ball bounces back to half its original height viz. 0.5 m. In the next bounce its rise is halved again to 0.25 m; and so on. The ball bounces about 20 times before coming to rest. What is the total distance the ball bounces before coming to rest? The value of the term 1/2^19 is very small and may be neglected for ease of writing the result. and arrive at the same answer. I think the first method is more elegant. Doubling is the basis for understanding and planning in situations like population growth, increase in bacterial populations, nuclear power production, inflation, banking and much much more. Puzzle 1: What is the lowest number of weights you need to weigh objects from 1 kg up to 50 kg. Weight of each object is an integral number of kg. 1, 2, 4, 8, 16,.. for any term, the sum of preceding terms is one less than the value of the term. This holds for all terms in this sequence (an example of a geometric series). To measure integral kg weights up to 50 kg, we need weights 1, 2, 4, 8, 16 and 32 - altogether 6 weights. You can check that these will actually work fine. In fact, the weights will measure objects up to 63 kg. Puzzle 2: What is the lowest number of weights you need to weigh objects from 1 kg up to 50 kg. Weight of each object is an integral number of grams. Solution: This is an extension of puzzle 1. We still need to weigh integral kg, so we need the 6 weights as before. But we now also need to weigh from 1 gram to 999 grams. This means that we should have weights of 1, 2, 4, 8, 16, 32, 64, 128, 256 and 512 grams - 10 additional weights. This makes 16 weights altogether to be able to weigh object up to 50 kg with 1 gram resolution. Not bad.